Cine Meter II measures light and color, so you can light and shoot and know what you'll get. > It's a zoomable spotmeter with an RGB waveform monitor and a false-color picture. 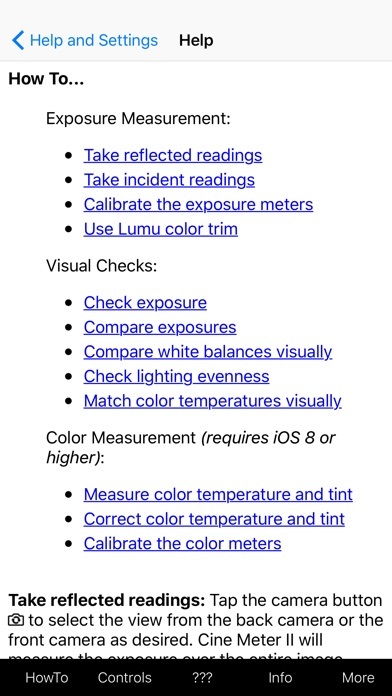 > It's a color meter, showing color temperature in kelvins and green/magenta tint in Wratten/CC values and giving you corrections to or from your target color temperature (color metering requires iOS 8+, and Luxi or a gray card). > Measures more than just shutter-priority or aperture-priority: calculate shutter speed, shutter angle, aperture, ND, or ISO directly. 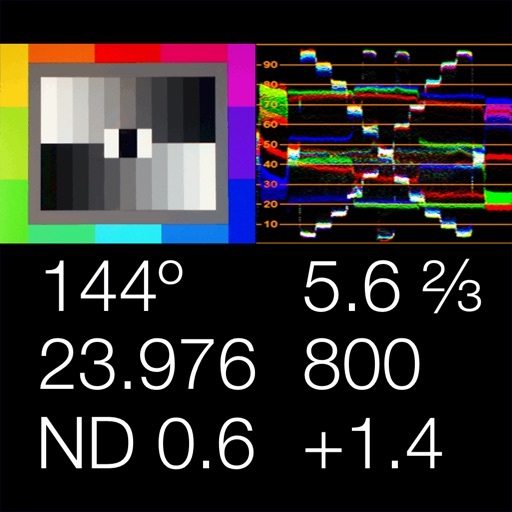 • The exposure meter shows your stop as a decimal value (for cameras with EVF iris readouts) or as a full stop and fraction (for cine lenses with marked iris rings). Cine Meter II lets you use shutter angles – ideal for Digital Bolex and Blackmagic cameras – as well as speeds, and you can dial in ND filters and arbitrary exposure compensations. The spotmeter is zoomable up to 15x magnification (recent devices, iOS 7 or later), using either the front or back camera. • False-color mode lets you define allowable contrast ranges, and see instantly which shadows are underexposed and what highlights risk clipping. Cine Meter II is NOT a flash meter; it can't measure strobes. 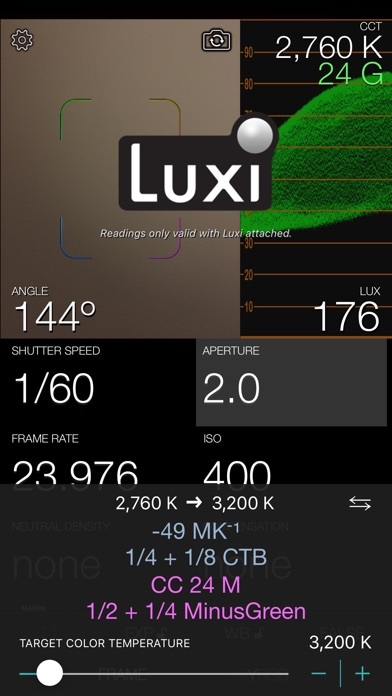 Cine Meter II does NOT work with Lumu Power. Cine Meter II gives you *absolute* light meter readings, but *relative* picture and waveform monitor levels: Cine Meter II’s picture and waveform monitor do not use the *exact* exposure shown by the light meter (they are close to the meter reading, but can differ from it slightly). The picture and waveform monitor show you *relative* levels within a scene, not *absolute* levels based on the meter reading. 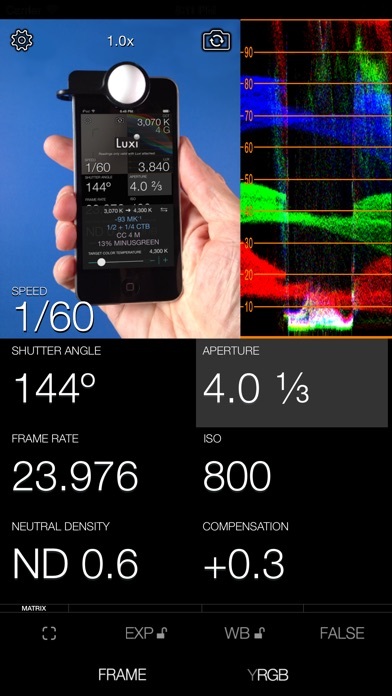 Shutter speeds, apertures, and ISOs shown in Cine Meter II are for metering purposes only and do not control the shutter speed, aperture, and ISO of the iPhone camera. The iPhone camera uses whatever exposure settings it needs to capture a reading. Cine Meter II is a light and color meter only; it is *not* a camera simulator. Cine Meter II measures light and color, so you can light and shoot and know what you’ll get. > It’s a zoomable spotmeter with an RGB waveform monitor and a false-color picture. 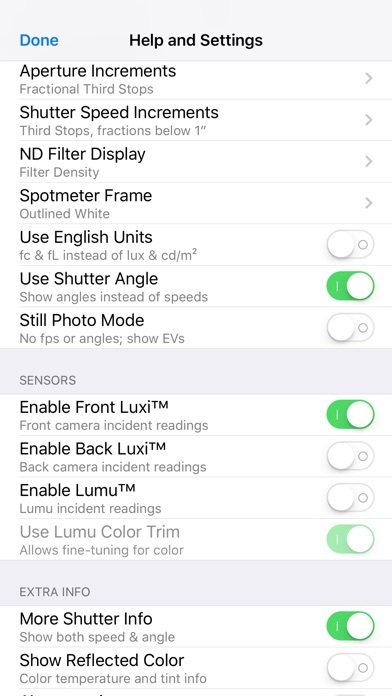 > It’s an incident meter using a Luxi™ or Lumu™ attachment, with lux and foot-candle readouts. 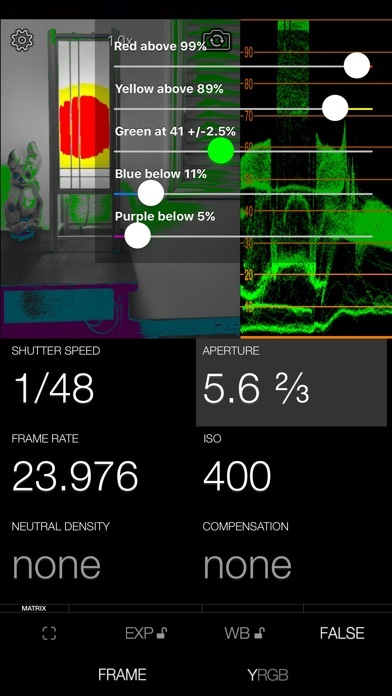 > It’s a color meter, showing color temperature in kelvins and green/magenta tint in Wratten/CC values and giving you corrections to or from your target color temperature (color metering requires iOS 8+, and Luxi or a gray card). • The waveform monitor shows you how light levels vary across a scene. You’ll see how smooth and even the lighting is on a greenscreen or background, and find subtle hotspots and shadows at a glance. The waveform’s RGB mode shows you color imbalances in the image and gives you a handy way to check color purity and separation for chroma-keying.